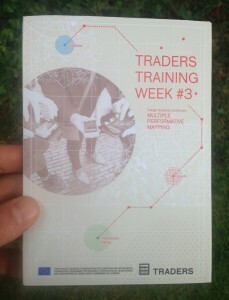 The third TRADERS TRSW (Training through Research Synergy Week) was meant to familiarise the TRADERS ESR’s with Naomi Bueno de Mesquita’s research in Multiple Performative Mapping. 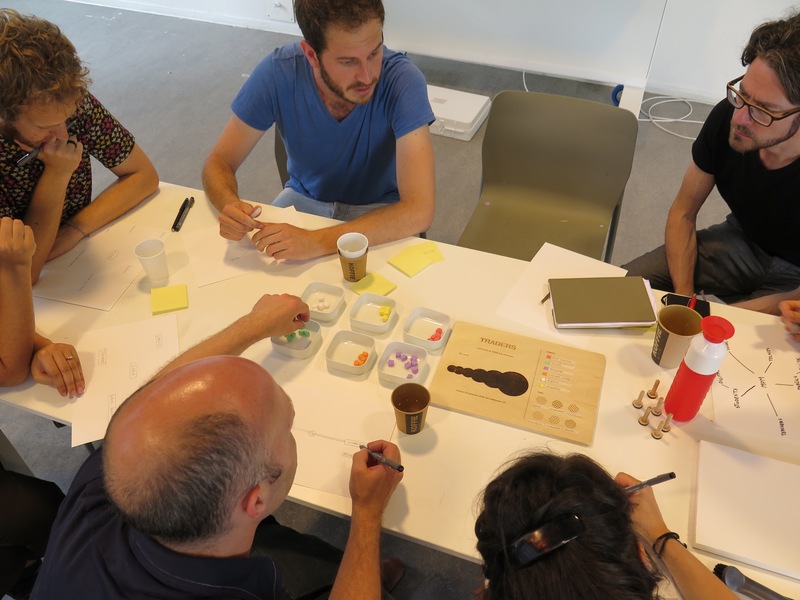 With the research being based at Design Academy Eindhoven, people from DAE with expertise in mapping were invited to contribute to this training week in the form of lectures and workshops. David Hamers (lector City and Countryside and supervisor of Naomi’s research within TRADERS) participated and assisted in the training week and he gave a lecture on the first day, Karianne Rygh (research associate of the former CRISP programme at DAE) participated and assisted in the training week and gave a workshop on the last day, Danielle Arets (lector and research associate of the former CRISP programme at DAE) gave a workshop, Ester van de Wiel (tutor at Public Private department) gave a workshop and Mikaela Steby Stenfalk (student) gave a small presentation of map-use and navigation in the Swedish phenomenon orienteering. External partners were also invited with the aim to extend and strengthen the TRADERS network. Nanna Verhoeff and Michiel de Lange from the Urban Interfaces group of the University of Utrecht and Sybille Lammes and Chris Perkins from the Charting the Digital research programme were invited to give lectures and Jana Wendler (from the university of Manchester and working with Chris Perkins) gave a workshop. The training week took place during the first week of July 2015 at Design Academy Eindhoven and in Eindhoven city and at University of Utrecht and in Utrecht city, with an intermezzo/ barbecue in Hollandsche Rading. 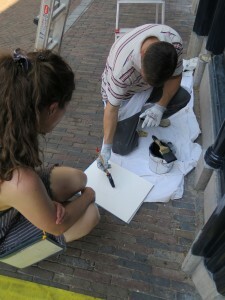 The training week commenced on Wednesday 1st of July at Design Academy Eindhoven. While each ESR received a pouch bag with a programme of the week, a logbook and a mobile phone, Naomi explained the overall programme of the week, the content of the pouch bags and how to use the different mapping-apps that were installed on the mobile phones. After this introduction David Hamers gave a lecture “Every map is an argument; Mapping strategies to engage with public space and public issues”, where he explained different traditions to talk about place, space and realm and he specified what a map entails (consisting of a frame, a scale and a legend) by giving different examples of maps and mapping practices at Design Academy Eindhoven. In his lecture David furthermore introduced words (performativity, virtual/ analogue, power relations, temporality and failure) to work with for the continuation of the week via a logbook. Each day of the week a different keyword was to be addressed (in the lectures and workshops) and the ESR’s were asked to elaborate on this word in their logbooks. The aim of this task was to come to a better understanding of the researchers perspective on the same word. Each ESR was asked to dedicate some time on a logbook. The logbook consisted of 10 pages and 5 keywords that the ESR’s were asked to work out. One page of the logbook was meant to write/ draw out how Naomi deals with a word (based on the reader, workshops and the things they’ve seen/ read about her research). On the second page the ESR’s were asked to write/ draw how they deal with this word in their own research. By the end of the week all the logbooks would be scanned and mapped out. This map would inform us on how each of the ESR’s perceive Naomi’s research in relation to the keywords and how they interpret those same words in their own research. This would be one of the outcomes of the training week. On the 11th of June (three weeks prior to the training week) a reader was sent to the ESR’s, consisting of seven articles of essential readings and a folder with articles for further readings, for the ones interested in reading about a specific topic/ speaker more in depth. The reader was chosen as such that the keywords (in relation to Naomi’s research) were introduced in the literature and that it could embark each day’s lecture from a more advanced point of departure. Having read the articles of the essential readings would help structure and focus the debate that followed the lectures and workshops of each day. As most of the literature was written by the speakers, clarifications regarding the literature could be asked for. On the second day of the training week Nanna Verhoeff, in her lecture “performativity in digital navigation”, elaborated on concepts of her book Mobile Screens and on the article “A Logic of Layers” (to be found in the reader). She referred back to her research in early cinema and locative media. She explained how, enabled by handheld mobile screens, locative media marked a shift toward indexical, deictic navigation. She described how iPhone navigation in her view is a performative practice. “The basic principle of screen-based navigation is that we see how we move—while how we move enables this vision. As such, in iPhone navigation both space and time unfold in practice. 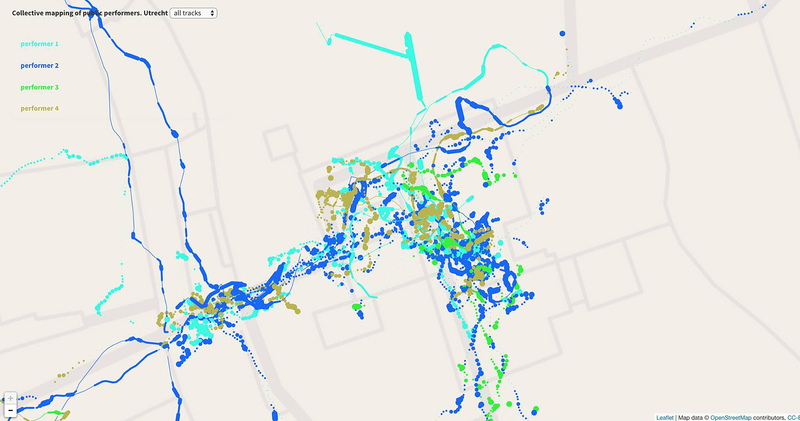 Its performative cartography is a process of simultaneous image capture and experience. This mutually constitutive relationship between seeing and moving—between perception and doing—is a fundamental principle in real-time, digital cartography.” (Verhoeff N., A logic of layers: Indexicality of iPhone Navigation in Augmented Reality, Routledge, 2012). On the third day of the training week Michiel de Lange, in his lecture “Mapping the smart city: dashboards, data, design.” put urban dashboards (mapping real-time city data) against more human centred and playful cartographies. In his lecture he pled for smart citizenship via performative maps rather than the mapping of big data to make smarter cities (often directed at functional uses of the city). He furthermore addressed the (political) implications of real-time mapping. What do the automated responsive systems do to our understanding (ontology) of the city and to our knowledge about (epistemology) the smart city? What are the implications of “the real-time”; not having time to reflect? An interesting debate emerged after the lecture with questions related to the affordances of mobile (measuring) devices; to what extent these produce citizen participation and in who’s interest/ benefits (thinking of the current developments of privatisation in public goods and services). The same afternoon Sybille Lammes gave a lecture “Cartographical interfaces: Materiality, mobility, mutability”, building on her articles “Destabilizing playgrounds: Cartographical interfaces, mutability, risk and play” and “Digital mapping as double tap: cartographic modes, calculations and failures.” (both to be found in the reader). In her lecture she addressed the cartographical interfaces through which spatial relations are understood and produced and how they take part in the creation of spatial relations/ how they co-produce spatial relations, very much in Latour’s line of thought of ANT. Understanding interfaces as having agency is an important way to negotiate power. Departing from here, OSM was discussed as an immutable mobile in which the predetermined gridlines cannot be changed (in this respect, an example of an (un)mapping that goes further than making inscriptions on the map and that can give users agency is the application Walkaway). On the fifth day of the training week Chris Perkins, in his lecture “Rethinking urban mapping: modes, moments and methods”, elaborated on the changing nature of the map as representation, with research charting the social contexts of map production. In his lecture he opted for critical, ethnographic and playful approaches to contemporary mapping to emphasise the role of actor-network based approaches. In this section Naomi will briefly give a summery of and an own reflection on some of the workshops. The first day of the training week we started with a workshop that was led by anthropologist Leeke Reinders. The ESR’s were given the task to ask individuals to draw a map of their city. Each researcher dealt differently with the task. 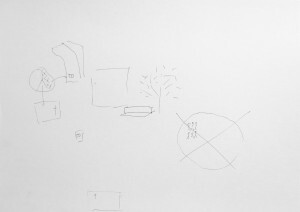 Some started drawing an own map, others drew a map while the person they were interviewing was talking. 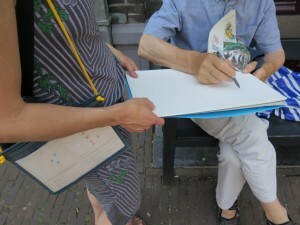 Only few of the researchers actually gave the pen to the stranger to let him/her draw a map (In my opinion an interesting observation from the perspective of participation, thinking that only by letting the other hold the pen true agency is given to that person). Performing this assignment myself I did notice difficulty in handing someone a pen to ask him/her to draw. It might have helped if we had had a clearer research question, but I was also aware of the process of seducing the other to draw (for instance by being genuinely interested or making a start in drawing) and the importance of being persistent in order to get more interesting findings. The second day of the training week we had the chance to experiment with the pervasive game You Are Not Here. I designed this game to explore the impact of digital forms of mapping (where YOU always appears in the centre of a map) on the collective experience of the city and collaborative practices in it. Various dots are shown on each persons mobile screen (the subject in this game is de-centralised from the map ), representing the players who are scattered around the city. The players have to find out where they are positioned on the screen by applying a navigational strategy and observing what digital traces the dots leave behind. When a player recognises him/herself and selects this dot, another person to follow is selected. The first player that is able to get physically close enough to the the dot that he/she is following wins the game. As it is not defined how the map of Utrecht is positioned under the players feet it is the challenge to leave traces in such way that it doesn’t reveal the map of Utrecht (for instance by choosing streets to walk that are less common or defining for the city’s cartographic plan). This is a collective endeavour to make the assignment for the competitors more challenging (the longer it takes for the map to be recognised by the players, the more difficult it is to find one’s position on the screen). Unfortunately the game didn’t last long (someone won it after 5 minutes!) 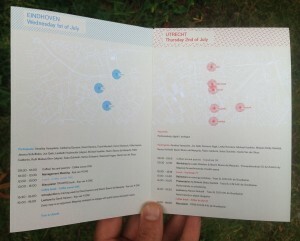 so we didn’t get the chance to see the map of Utrecht emerge or to observe the players strategies. To avoid this from happening we should have ‘shuffled the cards better’ (walked for a longer period of time separated from each other to have a bigger distance between the players). 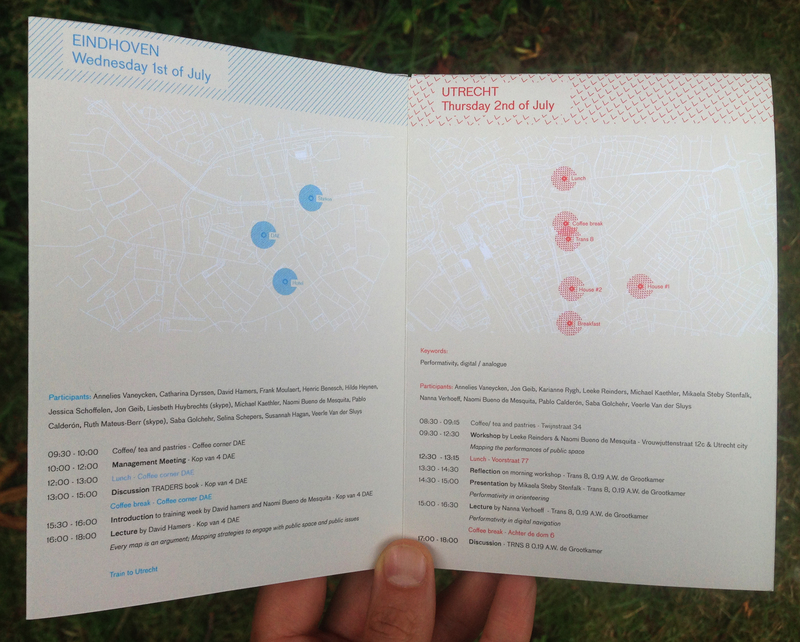 That same afternoon we experimented with another mapping session (also using an application that I designed) in which the cartographers were asked to collectively map public performers around the Dom tower. The legend consisted of four categories, each representing a different ‘public performer’. Prior to staring, the legend was collectively decided upon on the square. It was decided that we would map the following performers: socks and sandals, backpacks, serious camera’s and bike-theme shirts. The cartographers were supposed to follow people of a category (each category was mapped for the duration of 20 minutes) by standing/ walking as close as possible to the subject with which they were able to leave a trace of that person on the digital map. The longer the cartographer stood still, the thicker the line on the map would become, allowing the more dynamic aspect of velocity and time to be mapped. 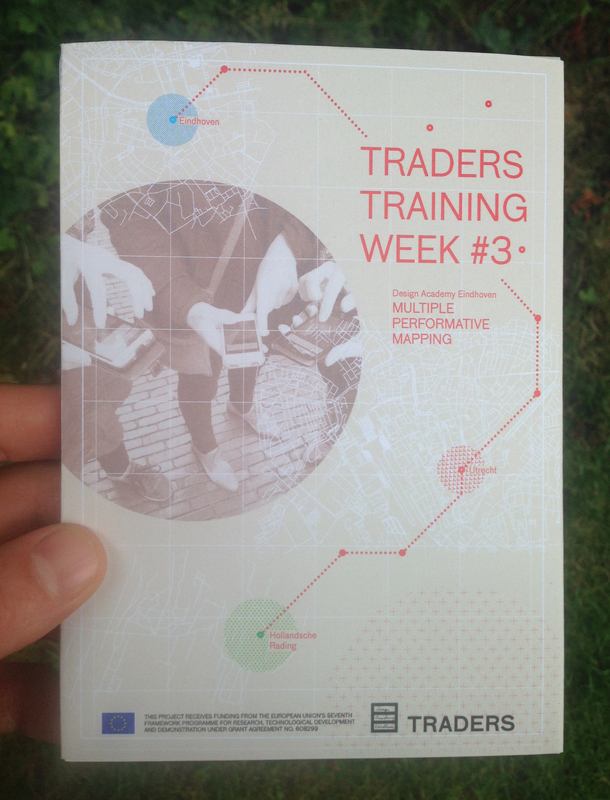 On the last day of the training week Karianne Rygh and I organised a workshop “co-creating a common TRADERS legend” (in my research I often co-create the map’s legend before or while mapping as a way to explore more participatory approaches to map-making). The purpose of this workshop was to map the places and people that each researcher uses to construct knowledge, and the tools that are uses to extract this knowledge. The map would give insight where overlaps between ESR’s exist (being areas of interest for a further collaboration between the researchers) and to give insight in the TRADERS network. 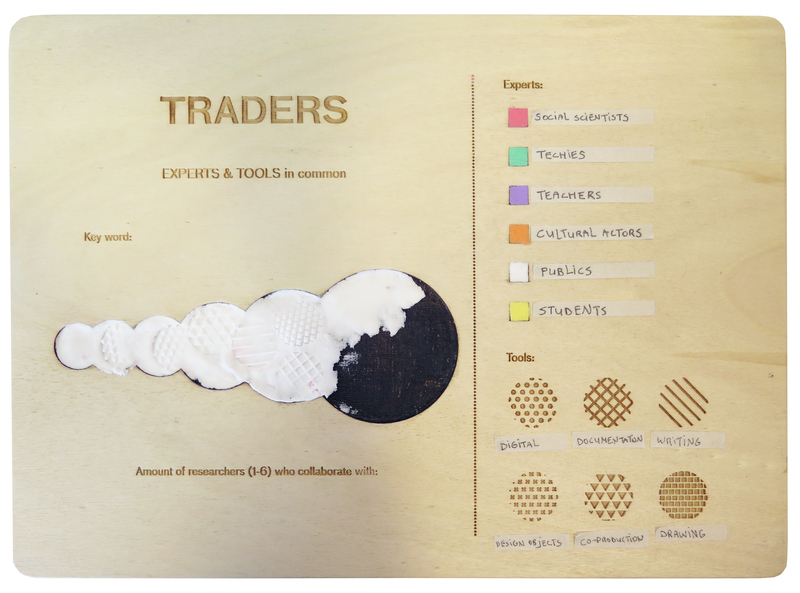 Creating a common TRADERS legend that consisted of experts was relatively easy, while it turned out much more challenging to define a common legend for tools or methods that we all use. The reason for it being that we all have different interpretations to the same words. For instance, Annelies’ interpretation of the word “play” is very different than mine because our ideas of the purpose of this word for our research do not match. To my opinion, if we are to communicate our research to each other and give constructive feedback on it, it is crucial that we further elaborate on creating a common language or a way to understand each persons perspective prior to having a discussion. In this workshop, as a result, we worked with a weak legend (tools that were not enough re/defined). In the reading of the map, for the part of the experts that we (as TRADERS community) work with, it became apparent that only few researchers intensely work with students, but all of us work with different publics (the experts that are most worked with within the TRADERS community). Thinking that the outcome of the TRADERS project in the brief to the EU is promised to be a transferable toolkit, I believe it was crucial to start the debate on what this could entail. Although this workshop was less successful in demonstrating where overlaps between different ESR’s exist, it became clear that the problem lies in the creation of a legend and only by doing this workshop did it become apparent that what is lacking is a common language or understanding of each other’s interpretations of the same words. To have more constructive discussions and feedback this should be worked on. 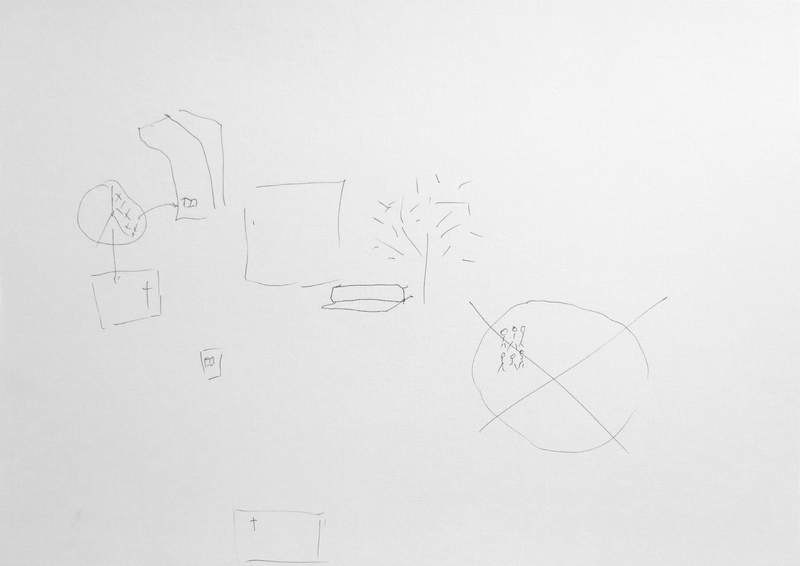 Asking participant to draw/ map places of importance. Co-creating a Common Traders Legend. Workshop together with Karianne Rygh.